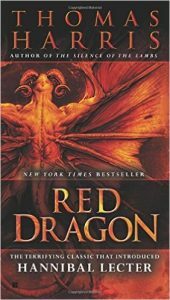 Red Dragon is the novel that introduces the character Hannibal Lecter. I had been wanting to read it for quite some time and, when I finally got around to doing so, I was surprised to discover that the famous Dr Lecter is not a constant part of the storyline but, instead, just someone who appears every now and again in the background. Background or not; he is still a great character. The main storyline concerns a serial killer called the Red Dragon. In their efforts to catch the Dragon, the police turn to a forensic specialist called Will Graham. Will Graham has taken an early retirement after tracking down, and being injured by, a particularly nasty serial killer. That serial killer is now languishing in a mental hospital thanks to Mr Graham’s efforts and he is, of course, Hannibal Lecter. Will Graham agrees to help track down the Red Dragon. He leaves the tranquil life that he has made for himself behind, visits Lecter, and asks his help to gain an insight inside the Dragon’s head. The Red Dragon is a particularly nasty and heartless killer, as is Dr Lecter, but Lecter is a more subtle monster. Both killers are equally original and memorable characters though. As I progressed through the book and learnt more about the Dragon’s background I began to gain an understanding of the factors that perhaps caused the Dragon to become such a monster. I couldn’t say the same thing about Will Graham, but I got the impression that he was a character who didn’t really know himself as well as he might, and perhaps didn’t want to. Red Dragon has a good storyline. The book is populated by some very memorable characters and, while reading the story, I got the impression that Thomas Harris really knows his stuff when it comes to forensic science. I found it very interesting indeed when the forensic evidence was gathered and tested, it all sounded very believable, and this is just one of the many reasons that I enjoyed Red Dragon so much.